It can be hard to get motivated or get out of bed when the day is nothing but gray. Somewhere, there’s a whole world of color, and we’re here to share it with you. If you can’t make it to these incredible, rainbow-hued locations, you can travel vicariously through this collection of stunning photos. They might make your day a little more colorful. Namaqualand is home to many species of flowers found nowhere else in the world. For much of the year, it’s a barren, arid landscape. In spring, it bursts into color. “Pamukkale” means “cotton castle” in Turkish, for the site’s natural white stone. It’s known for its hot springs, which have served a destination for locals and tourists for centuries. The terraces seen here are created by mineral deposits left by the hot water. The ice caves beneath the glacier are magical blue worlds, but you might want to hurry on this one. Due to climate change, it’s possible that icy wonders like this won’t be around for much longer. After lasting hundreds of years at 12 miles long, this glacier has shrunk by 2 miles since 1958. 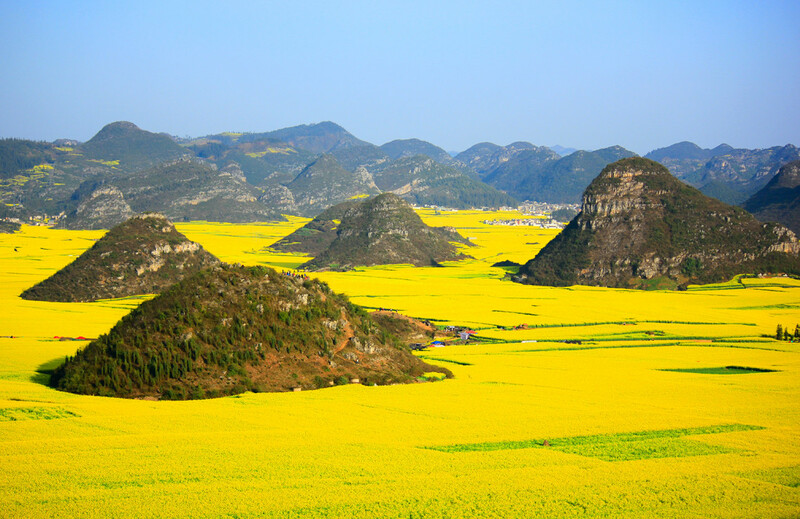 In spring, this county in the eastern Yunnan province is known for its fields of blooming canola (or rapeseed) flowers. The flowers bloom in spring, and attract not only photographers, but bees as well. Luoping, as a result, is also a center for honey production. This glacier-fed lake in Alberta’s Banff National Park is known for its distinctive blue shade. The color is caused by the way light refracts off the mineral deposits. Combined with the sunset light on the mountains and the deep green trees, it’s a breathtaking view. England has a reputation for being dreary, but Cornwall lights up when the poppies bloom over the Celtic Sea. This hot spring in Yellowstone National Park is the largest in the U.S. Its mineral-rich water is home to many different types of bacteria. Depending on the temperature of the water and the ratio of chlorophyll to carotenoids, the bacteria range from red to green. The blue at the center is the natural color of the water. The Netherlands are known the world over for their tulip production. The largest tulip farms have around 7 million plants. 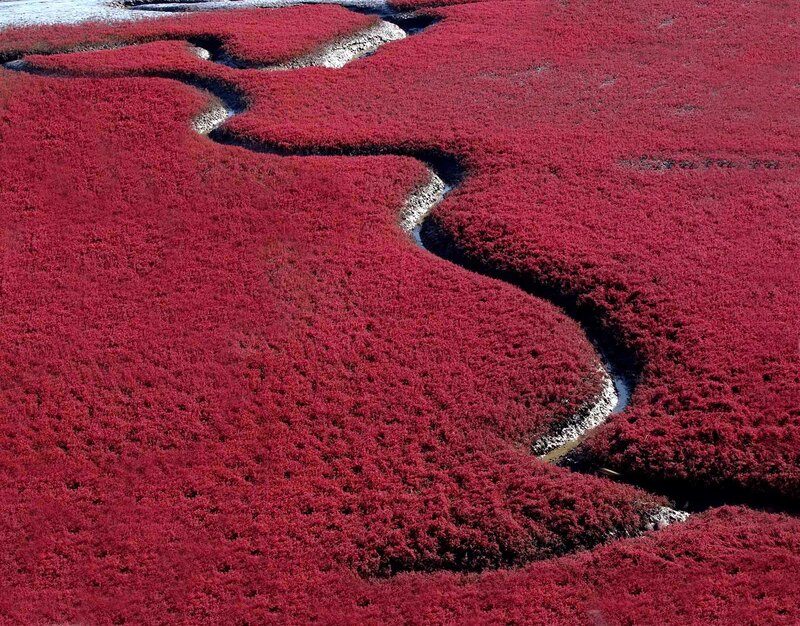 The suaeda plants in these wetlands thrive on its highly alkaline soil, and are notable for their deep red color. Located in the Recherche Archipelago this bright pink lake is striking. The cause of the color is still up for debate, but common theories point to the color of the bacteria living in its salty water. You might not think dandelions are special, but when they’re carpeting the Alps, they take on a whole new beauty. Besides serving as home to a huge variety of plants, the Valley of Flowers, located in West Himalaya in northern India, is also home to rare and endangered animals like the snow leopard. 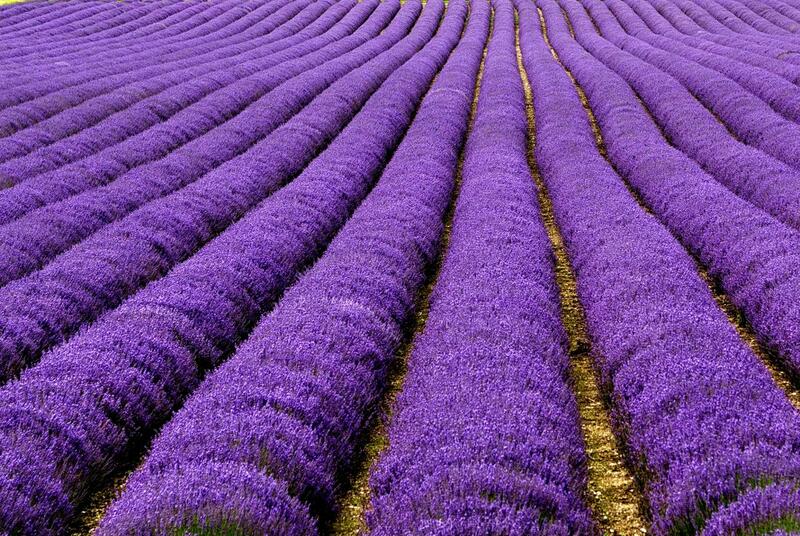 France is famous for its lavender farms, where the bright and fragrant flowers stretch out forever. Standing in one of these fields would smell amazing, but sadly we’ll have to content ourselves with the color. This park around Japan’s Mt. Fuji not only boasts flowers, but also for the striking pink and white shibazakura moss growing around the mountain’s base. Like the other lakes on this list, Five-Flower Lake gets its distinctive color from mineral deposits and from its diverse population of wildlife. Fallen trees can be seen criss-crossing the bottom of the shallow lake as well. If you’re trapped inside, or if it’s a dreary overcast day, these images will remind you that there’s a bright and beautiful world out there. You just have to be ready to explore it when you have the time.